“Are you alone?” asked the clerk who checked me into my hotel in Puerto Princesa. 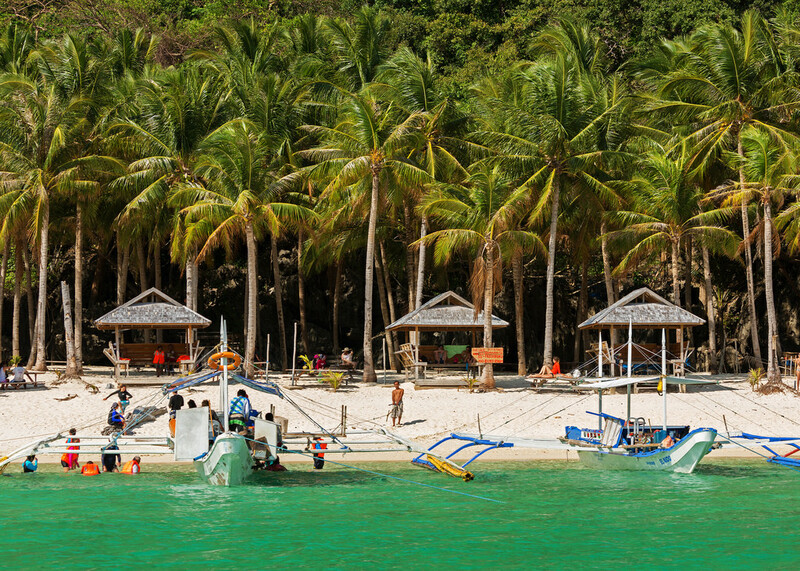 Puerto Princesa is the largest city on the relatively undeveloped island of Palawan. 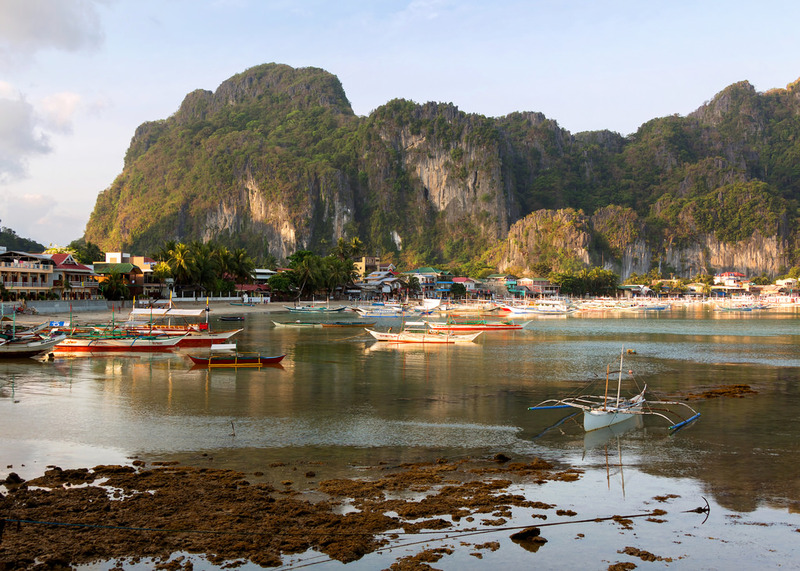 I only stayed there one night before taking a shared minivan about five hours north to the much smaller town of El Nido, a popular base for exploring the beaches, lagoons, and limestone cliffs of the Bacuit Archipelago. 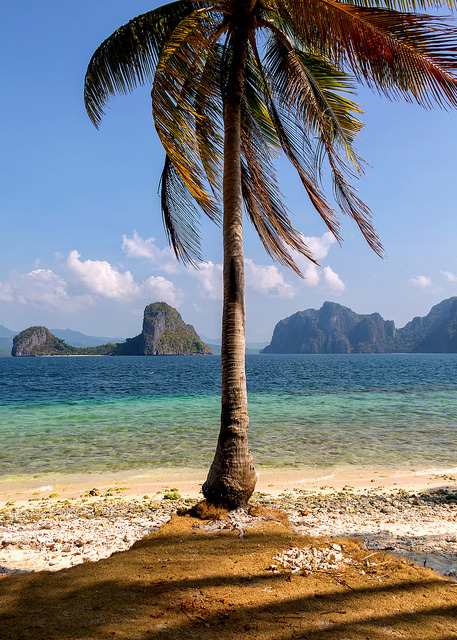 For the past two years Condé Nast has named Palawan “the most beautiful island in the world,” and – while I wouldn’t go that far – the scenery is pretty impressive. 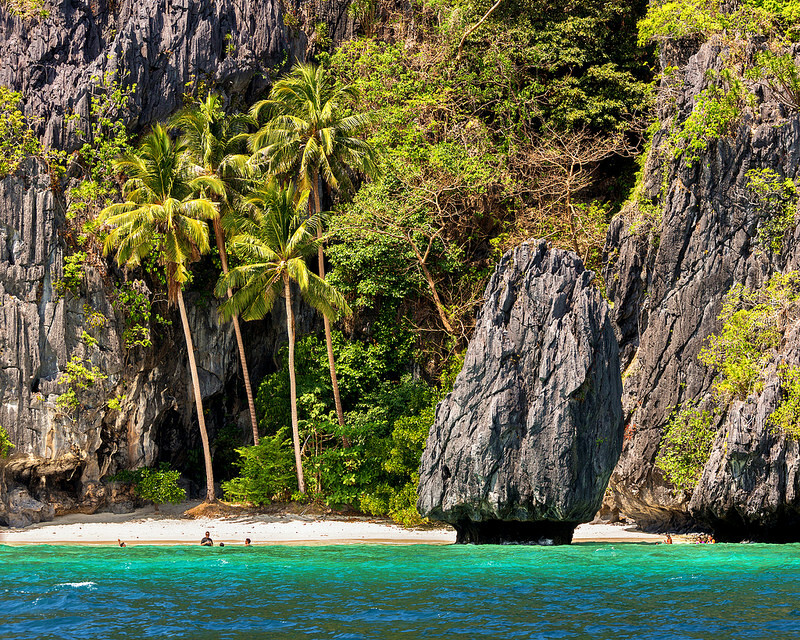 El Nido (“The Nest” in Spanish) sits on a relatively small triangle of flat land bordered by a highway, a wall of nearly vertical limestone, and a shallow cove with a sandy beach. Boats fill the cove every morning, ready to take tourists out island hopping. 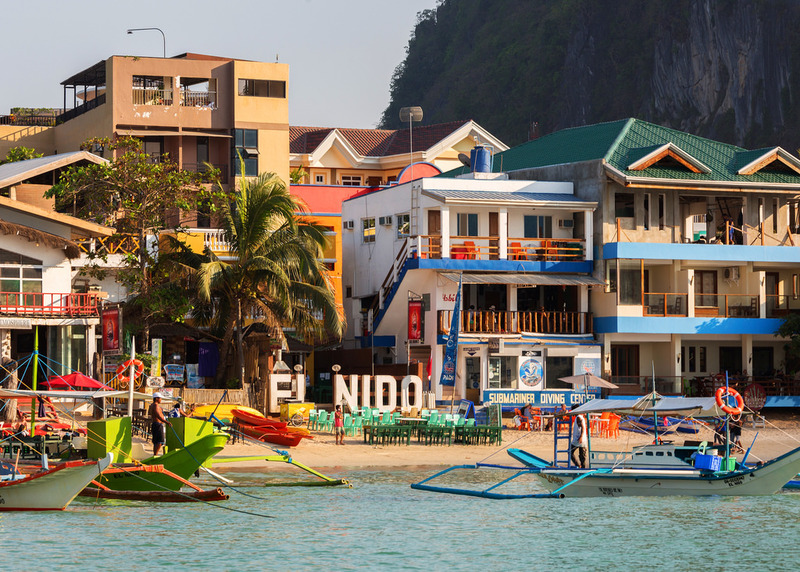 I arrived in El Nido in the afternoon and booked a boat tour for the next day. “You are alone?” asked our boat’s guide the next morning. 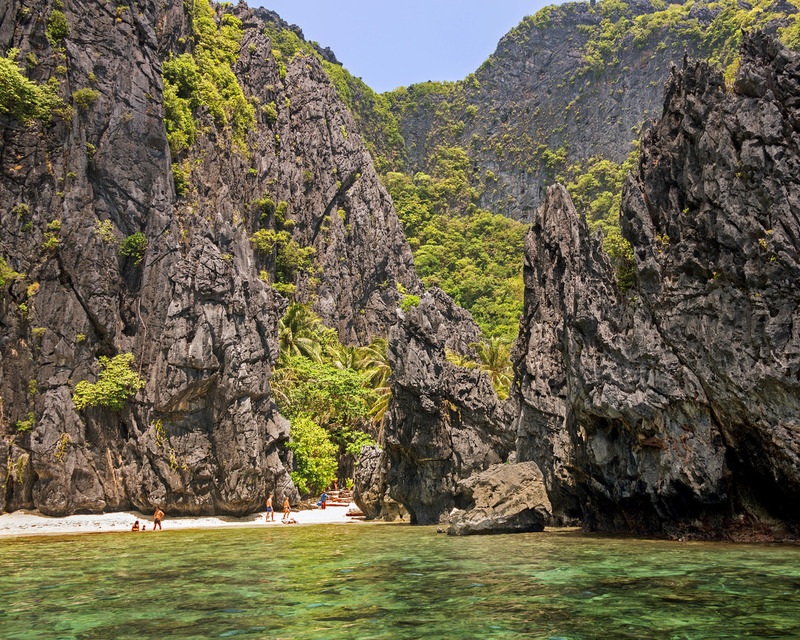 El Nido’s island-hopping day trips have been standardized into four tours: A, B, C, and D. Each tour visits five different places in Bacuit Bay. 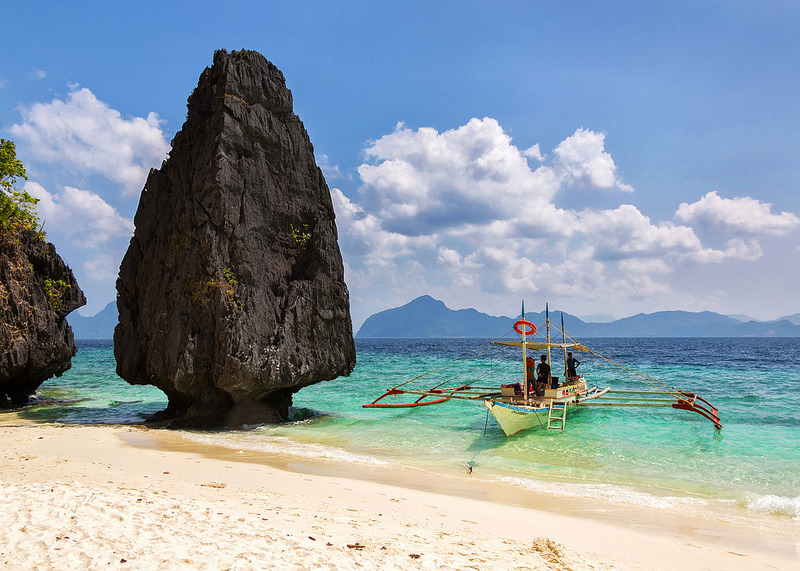 The people at my hotel said Tour A was the best, so I’d chosen that one, as had almost everyone else in El Nido, apparently. A fleet of boats surrounded us all day. 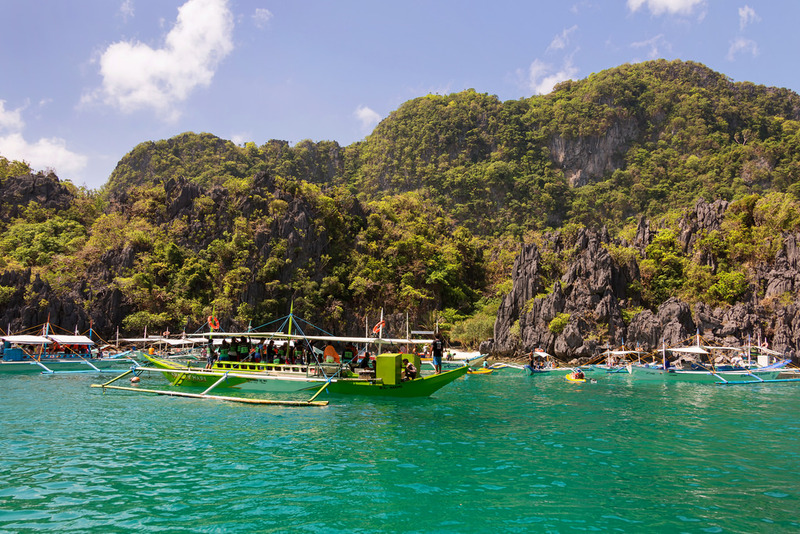 There were literally traffic jams at almost all our stops, including a solid wall of people and boats at the inappropriately-named Secret Lagoon. We also visited Small Lagoon, Big Lagoon, Shimizu Island, and Seven Commando Beach. Along the way we passed some fancy island resorts that our guide said cost more than $1,000 a night. There were several opportunities to snorkel, which provided a temporary escape from the masses. My favorite moment was spotting a couple of those cool little orange-and-white-striped Clownfish that live symbiotically with anemones. My least favorite moments were every time I caught a glimpse of the Italian guy in our boat who was rocking a poker-themed Speedo. 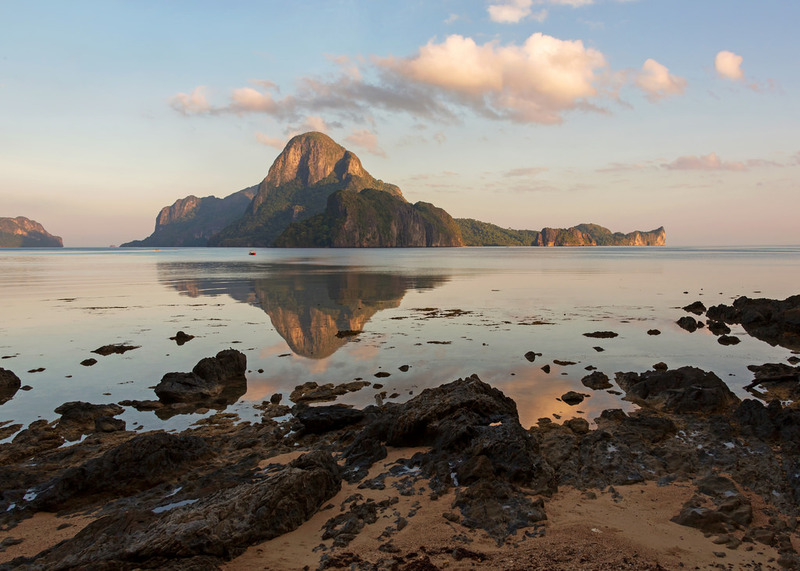 I spent the next day walking around town and working on photos, which left me with only one more day in El Nido. “What’s the least popular tour?” I asked a clerk at my hotel. “Tour B.” He wasn’t even sure if there would be enough interest in Tour B for it to be offered tomorrow. “Perfect. Please sign me up if it’s available,” I said. Tour B was available and a guide met me at my hotel the next morning. “Are you here alone?” he asked. Tour B was as unpopular as advertised. There were only a handful of other boats around, but the places we went were just as beautiful as the stops on Tour A. 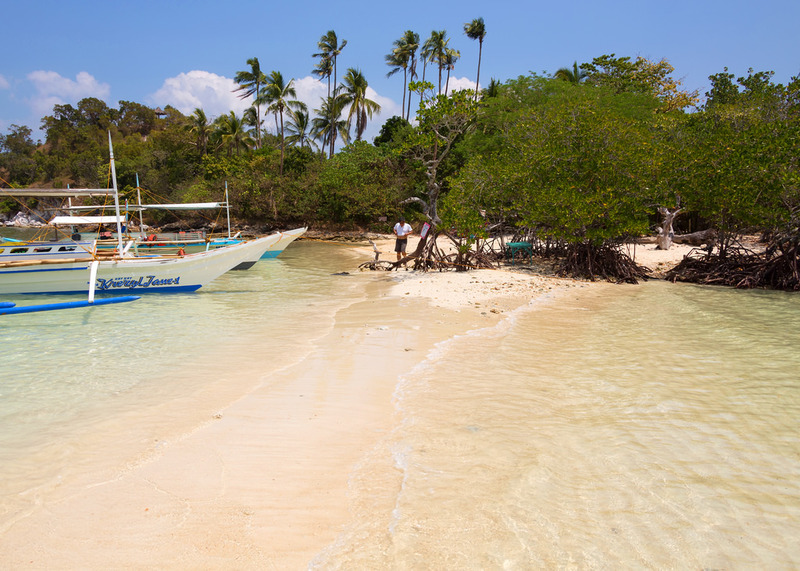 We visited Entalula Island, Cudugnon Cave, Cathedral Cave, Snake Island, and Pinagbuyutan Island. What a difference it made to avoid the crowds. 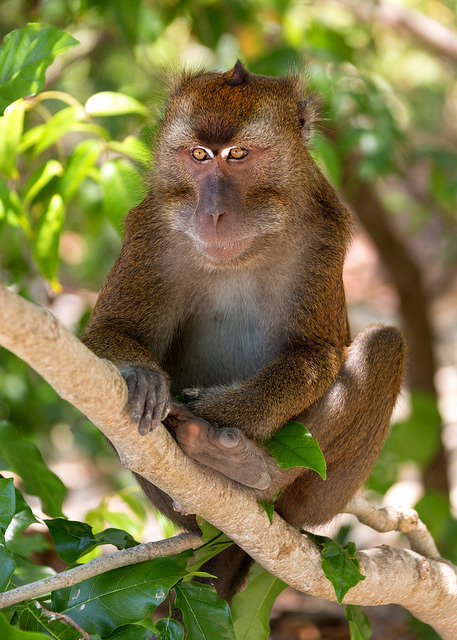 Snake Island even provided my first wild monkey sighting of the trip. I wished our guide spoke English well enough that I could have asked him about the name of our boat: Sweater Hatch. Surely that’s a strong contender for the Mount Rushmore of least inspiring boat names. I woke up the next morning to the prospect of three straight transportation days. First up was the five hour minivan ride back to Puerto Princesa, which went fine. 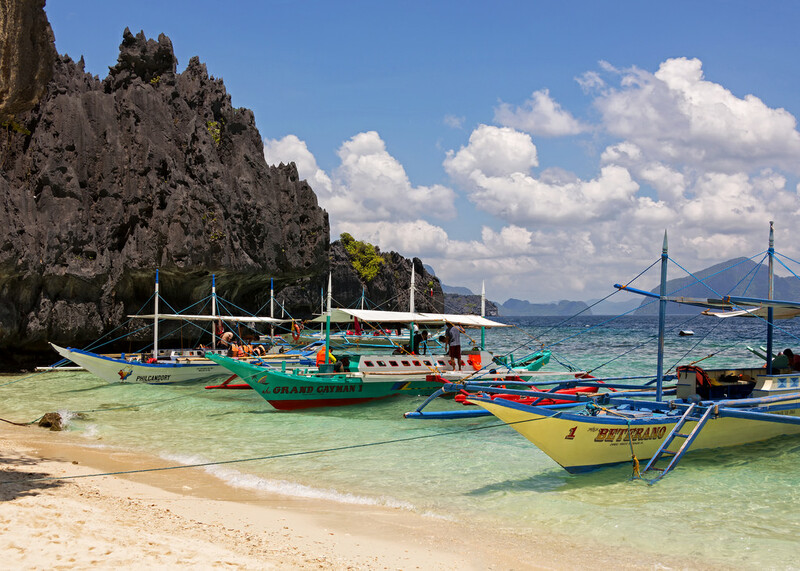 Then the following day was my return flight to Manila, where the traffic – thanks to the Good Friday holiday – was shockingly reasonable. And the day after that I left for Malaysia. On my final drive to the airport my taxi’s radio played “Eternal Flame” by the Bangles, a fitting pop ballad farewell. 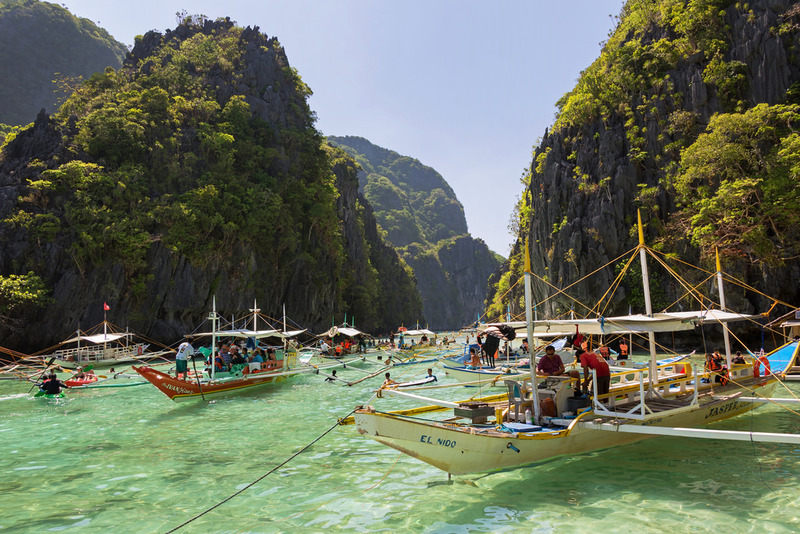 I had a good time in the Philippines, and swimming with whale sharks was a big highlight. But I definitely had to work for it. My guidebook warns that you need to peel back the Philippines’ rough outer shell to get to the good parts, and that strikes me as being accurate. Getting from place to place took a long time, thanks to ubiquitous congestion, poor infrastructure, and sometimes-maddening inefficiency. Good food was surprisingly challenging to find, and more often than not the wait staff at a restaurant paid little attention to their customers. Almost everyone I met spoke some English, which made things easier, but almost no one I met spoke English well enough to have a substantive conversation. People I counted on for help – hotel clerks, cab drivers, bus drivers, tour guides, etc. – rarely shared all the information I could have used, and usually when they did it was only because I happened to have asked the right questions. On the other hand, the Filipinos I met were invariably friendly and laid back. The country is full of beauty. Prices for food, hotels, and transportation were extremely low, and the locals never seemed to try to gouge tourists. I felt entirely safe everywhere I went, at any hour. 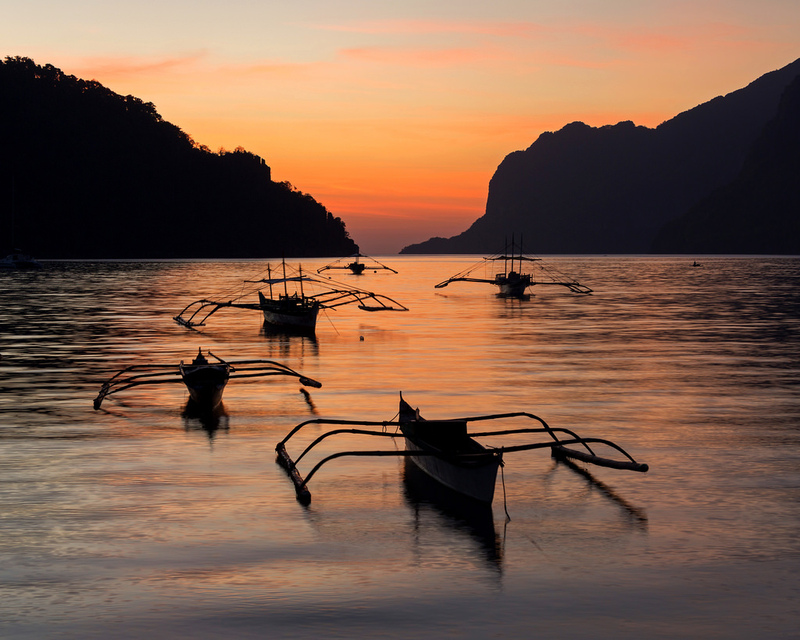 For someone with my travel preferences, the effort-to-reward ratio in the Philippines seemed to be about 1:1. Not bad, but quite a bit different than the experience I’ve had in other Southeast Asian countries, where the energy I put in was only a small fraction of the payoff.